694,061 page views over twelve months, updated daily. The Government has published a new edition of its statutory guidance on local government investments. The new edition applies in England only, for accounting periods starting on or after 1st April 2018. The guidance can be found by clicking here. It was great to see so many of you at PKF Littlejohn's External Audit briefing last week. We have now received a copy of the power point slides for you to access to review the course content. Today's clerks 3 course has been postponed due to the forecast of snow all afternoon in Anstey. Please do not travel. We will be calling all delegates to inform them and provide the new date. Finding & Bidding for Project Funding - Tonight’s course is running! Please note no snow is forecast at our training venue in Anstey for tonight's course and so it is definitely running. All booked delegates should attend. The National Association of Local Councils (NALC) has published, free for its members, a comprehensive toolkit to support local councils prepare for the General Data Protection Regulation (GDPR), which will take effect in the UK from 25 May 2018. As an aid to help new Clerks and Councillors LRALC has produced the attached schedule of key dates for the Parish/ Town Council diary. BHIB Insurance Brokers have kindly sponsored the production of 250 USB sticks for use by LRALC at its training events for councillors, chairmen, and clerks. 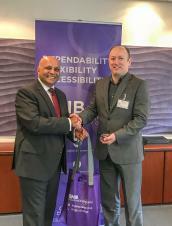 Ashwin Mistry OBE, Chief Executive of BHIB, handed over the USB sticks to Jake Atkinson, Chief Executive of LRALC, at their Leicester HQ earlier today. We have received several enquiries recently from councils wishing to co-opt a new councillor but unsure about the said councillor's eligibility for office. Local councils are required to ensure that persons co-opted to the council are eligible to hold office as a local councillor. The qualifications and disqualifications are contained in the Local Government Act 1972, Sections 79 and 80. Just a reminder about PKF Littlejohn's free external audit briefing on 26th February 2018, 11.30am - 1.00pm, at Elizabeth Park Sports and Community Centre, Thurmaston. Please see here for booking details: https://www.leicestershireandrutlandalc.gov.uk/pkf-littlejohn---external-audit.html. The latest NALC briefing on the role of the Data Protection Officer under the General Data Protection Regulation is available for download below. You must be logged in to this website as a user in order to access it. XHTML 1.0 validated. WCAG compliant. Page generated in 0.0986 seconds.